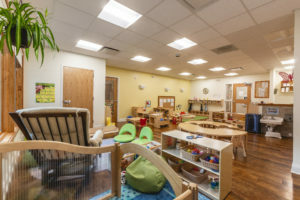 Our toddler class is a very loving, nurturing, home-like environment for children ages 12 – 30 months. 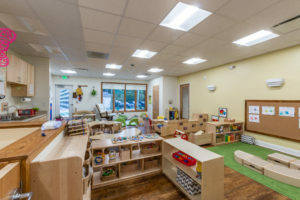 The Toddler class opened in our brand new building in October 2018! With a maximum ratio of 1 teacher for every 5 children (and 10 children max enrollment), the class is small and close knit. You will get to know your child’s teacher well – we encourage collaboration of parents and teachers, and we believe it is in the child’s best interest when parents and teachers work together. Teachers will be well educated in child-development, and plan daily activities to help your child excel and grow. The teachers observe, document, and assess your child’s progress, and meet with you at least twice/year for parent-teacher conferences. In this way, we make sure that all of the development is on track, and work with you, the parent, to address any issues that may come up. Kelie, Lead Teacher in the Toddler Class, has completed her associates degree in Early Childhood Ed. 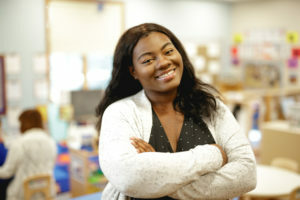 She has been teaching since 2010, and has been with our team since 2017! 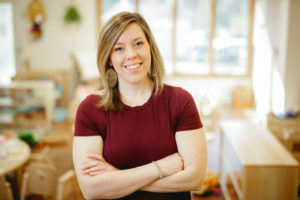 Emily, Co-Teacher, has many years of working with different child education programs and raising her three children. She has been a part of our team since 2018. Anesia is our Assistant Teacher and Music Teacher! 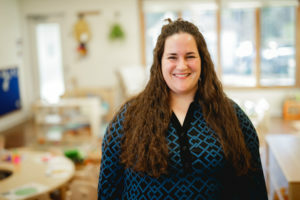 When she’s not working with the Toddlers, she teaches music to all of the classes, infant – PreK4. Our teachers worked hard to design a classroom that would support the children’s learning and development! 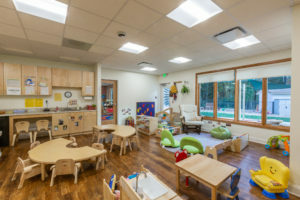 We love our natural light and various areas for Toddler exploration.